Artist 6 28 made us sing “ who let the dogs out ” once again! A little Thai flair is heading to Japan at FEWMANY gallery! 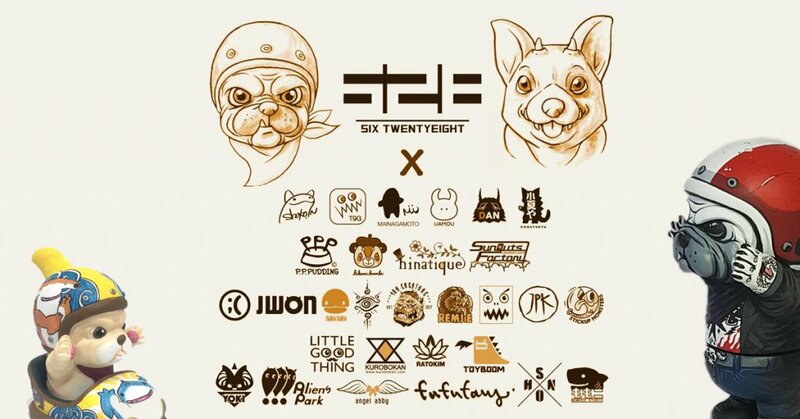 As well as his own special releases a wide range of 20+ artists from around the world will be taking on 6 28’s new Half Corgi dog and Dragon mashup CORGIDORA’s as well as 6 28’s classic MITT Bulldog next. Already teasers and Work in progress shots (which you can check below) have started to arrive in Japan and preparations are heavily underway. Featuring artists include:- 6 28,..X.., 48H. Creature, Aliens Park, Angel Abby, ;(rybaby, Dan Kaiju, Fufufanny, Hikari Bambi, Hinatique, Javier Jiménez, Jon-Paul Kaiser, Jwon, Konatsuya, Kurobokan, Little Good Thing, Mai Nagamoto, Momoco Studio, Ngaew Ngaew, P.P.Pudding, Rampage Toys, Rato Kim, Recycle C, Remjie, Shoko Nakazawa, Shonside, Sunguts, T9G, Toyboom, Uamou, Yoyo Yeung just to name a few.